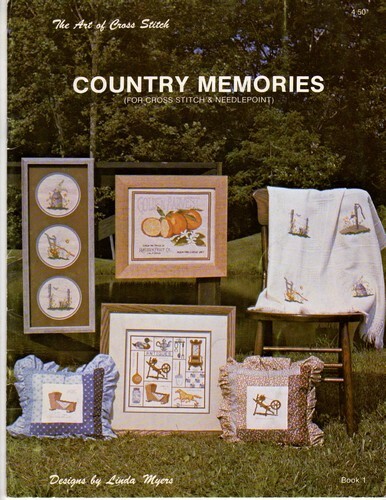 Art of Cross Stitch Country Memories Linda Myers counted cross stitch booklet. Antique Shadowbox, Country Pump, Country Fence, Country Milkcan, Country Plow, The Things I Prize, Golden Harvest Antique Fruit Crate Label, Strawberry Pillow, Candy Jar Cover, Backyard Gazebo, Backyard Well, Home Verse Planter, Homemade Butter, Acorn, Pumpkin Wagon. Price tag on cover.